Just a little post from us this week as we are in the middle of Easter school break and we have daddy off for a week of it so are FAR TO BUSY HAVING FUN! We are also at the beginning of the journey of the house buy / sell so I have spent the weekend de cluttering (gasp!) and cleaning, cleaning, cleaning! It is very satisfying living in a show home but I did feel bad when Bea asked me if it was ok to play and make a mess this morning! What I want to tell you about though is Beas new little creative hobby. She has been desperate to start sewing or something creative apart from colouring that she can do all herself. So when we headed to a local toy shop with both girls brandishing a £5 note they received from an Aunty as an Easter pressie, she was on the look out for something along these lines. She appeared (after a quick lesson in what she couldn’t afford which was quite interesting!) with a box with a French Knitting Dolly on it. Is this sewing mummy? She asked…When I explained that it was a type of knitting she was even more delighted as she has an audio book about a little girl learning to knit which we listen to in the car. 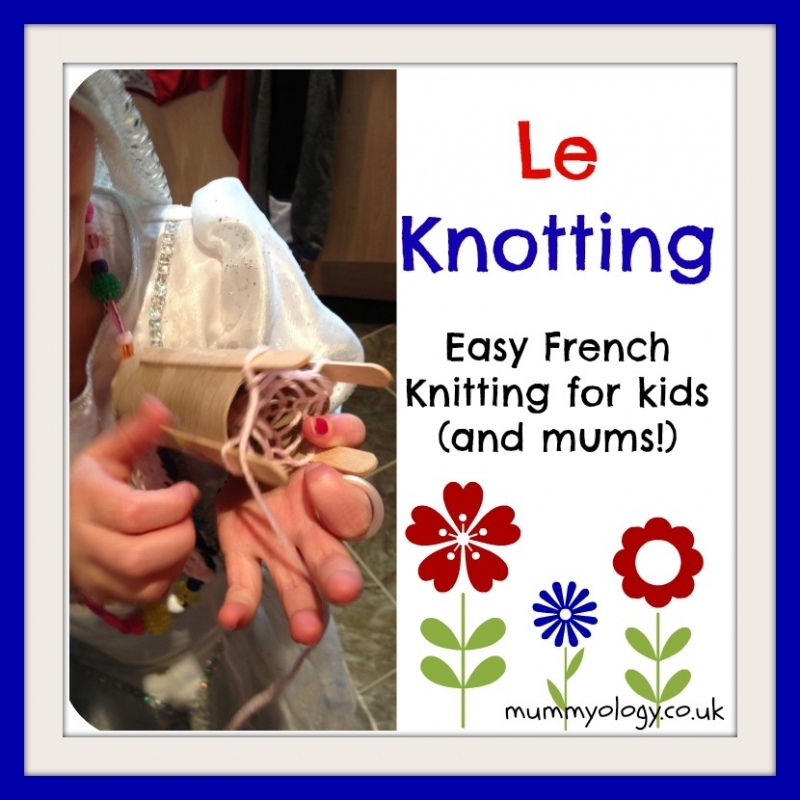 Now I have never done French Knitting even as a child and I have to say that the instructions that it came with sent me into a bit of a panic – I had a lot of wool, lots of bits wound round ‘a’ to ‘c’ and nothing going in the right direction! As I got myself in quite a knot, Bea hilariously suggested ‘mummy, I expect Ameya (her cousin) would know how to do this because she is learning French at school’…. Luckily I didn’t have to ask my 5 year old niece for her help but thank god for google! I found all kinds of video tutorials but the best thing I saw was how to make a bigger, kid finger friendly and mummyproof version using an empty toilet roll. This is simple genius at its best so I just had to share. 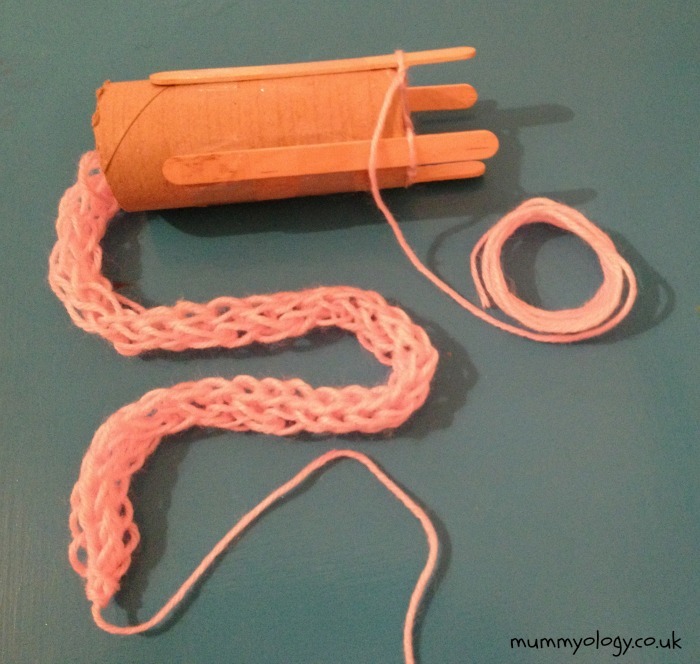 Sellotape your sticks around the cardboard roll spacing them evenly and you have made your knitting dolly. To begin knitting, feed one end of your yarn through the tube. You are now ready to start your first row of knitting! Begin the first round by holding the yarn in front of your first peg above the wrapped loop. Pull the bottom loop up and over the yarn and the peg, this creates one loop on the peg. Move over to the next peg and do the same, lift the bottom thread over the top and over the peg. Keep going, looping and looping round your pegs until you have a cord as long as is needed. To finish, thread your yarn onto a needle and run it through each loop on your sticks before popping them all off your sticks and pulling them tight and tying the yarn off. This is so simple and Bea got totally hooked and is so proud of the ‘scarf’ she is making her teddy! I am sure it wont be long until she graduates up to her ‘proper’ knitting dolly but its great practice and it is really lovely to see her pride in making her very own craft project! 4 EGGstremely easy Easter ideas 10 Top Tips…to help your kids to LOVE food 5 shows from way back when that you should inflict upon your kids Top tips for surviving your kids first day at big school! How to help your kids when they have BAD DREAMS How to make a dragon and other Chinese New Year Crafts Masterchef for mummies – 10 easy meals for your kids to enjoy How many women are you? wow, i have been teaching sewing to my niece, this is something which is much easier for me to make her understand. Would love to see more from you. I will subscribe to your blog for more posts like this.